A Cry for Mercy. In other healing scenes, the one healed is told to “go” and not say anything about the miracle. This phenomenon is described as the Mark’s “messianic secret.” There are many speculations as to why Jesus does not want word of his mighty deeds know far and wide. The one in which I hold to be more likely is the one in which Jesus does not want people’s perception of his Glory to be seen in the miracles and mighty deeds, but wants them to see the Glory fully revealed on the cross when they can see that God’s love for them has no limits. Now that they are close to the time of the cross, Jesus will not tell Bartimaeus to remain silent. Any attempt to silence the blind man falls to the crowd. The crowd had probably become quite hardened to seeing beggars along the roadside, and especially at the city gates, crying for alms. Now that a person of importance was coming, they did not want this distraction or delay. Undeterred, Bartimaeus resolutely continued his calling until he succeeded in drawing Jesus’ attention to himself. Pity – the feeling of sorrow caused by the suffering and misfortunes of others. Under these definitions, Bartimaeus is not asking for “pity;” he is asking for “compassion” and merciful action on Jesus’ part. The Call. 49 Jesus stopped and said, “Call him.” So they called the blind man, saying to him, “Take courage; get up, he is calling you.” 50 He threw aside his cloak, sprang up, and came to Jesus. Neither the blind man’s social status or the crowds’ rebuke matter to Jesus. It is evident that Bartimaeus has heard about Jesus of Nazareth and that his relentless crying of “Son of David, have pity upon me” reflects a conviction, formed on the basis of what he had heard, that Jesus could restore his sight. When Jesus orders that Bartimaeus be called, some in the crowd quickly change their tune and tell him to have courage. He reacts without hesitation and “threw aside his cloak.” This action is often passed over without much notice. If one assumes Bartimaeus is wearing the cloak, perhaps it is just cumbersome and would impede him. But if one assumes the cloak is spread out before him as a collection point for alms, then his casting aside the means of income and whatever income he had collected (no doubt representing his riches and wealth) stands in sharp contrast to the rich man who walked away from Jesus rather than let go of his wealth. 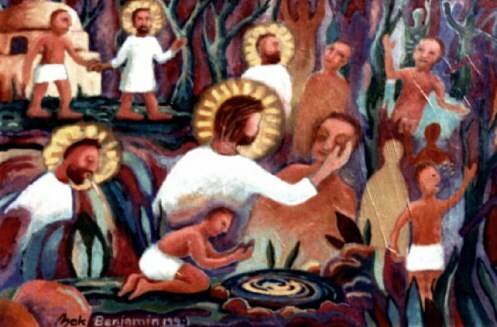 The blind man also takes his place among others who have spontaneously reacted to the presence of Christ in their live: Simon and Andrew leave their nets (1:18), James and John leave their boat (1:20), Levi leaves his tax office (2:14); Bartimaeus leaves his location and wealth. Mark 10:48 And many rebuked him, telling him to be silent. But he kept calling out all the more. The crowd thought that Bartimaeus was not worthy to call out to Jesus, impose demands upon him, or take his time, so they told him to be quiet. The blind man did not back off, but continued to cry out to Jesus. This is expressed in the imperfect tense (ekrazen) emphasizing that his call was ongoing. Mark 10:50 threw aside his cloak. The blind man had laid his cloak on the ground to collect alms from compassionate people. He now tossed it aside. This entry was posted in Scripture and tagged Bartimaeus, mark-10-46-51 by Friar Musings. Bookmark the permalink.